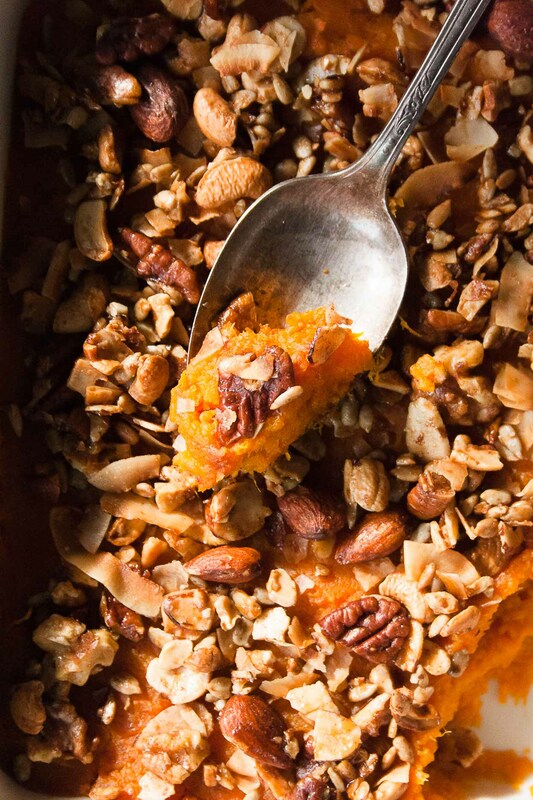 An easy side to dress up any Thanksgiving table – sweet potato casserole with crunchy granola! This simple dish is full of flavor and will please the pickiest eaters! I am freaking (!!) out today because somehow it is already November 1st. Freaking out because my favorite holiday is just a few short weeks away. Freaking out because Christmas is less than 2 months away. 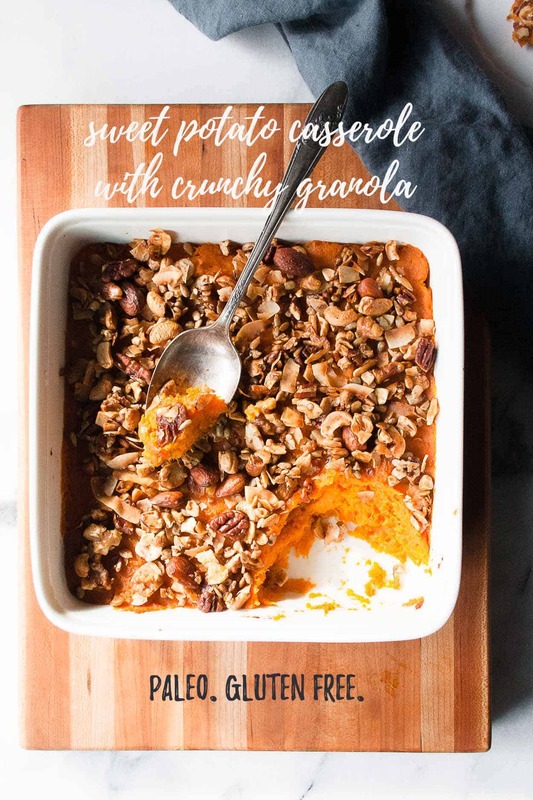 And freaking out because this sweet potato casserole with crunchy granola is one of 14 recipes that launched in my Paleo Thanksgiving e-book today! This e-book is a completely paleo Thanksgiving menu plan, shopping list, exclusive recipes, and prep tips on how to actually manage a big holiday meal like this! If you subscribe to my newsletter, you already received this free e-book in your inbox this morning. And if you haven’t subscribed yet, jump on my list HERE and I’ll send you the e-book right away! 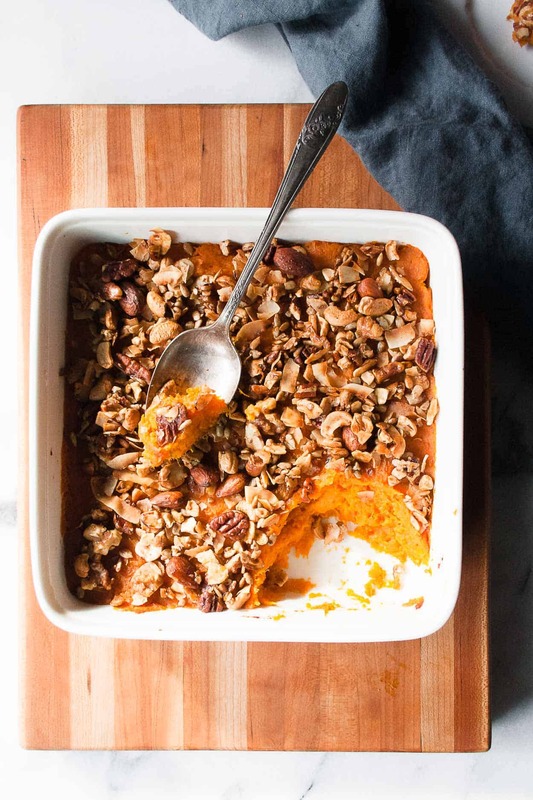 This sweet potato casserole with crunchy granola is in the book and on the menu for Thanksgiving! 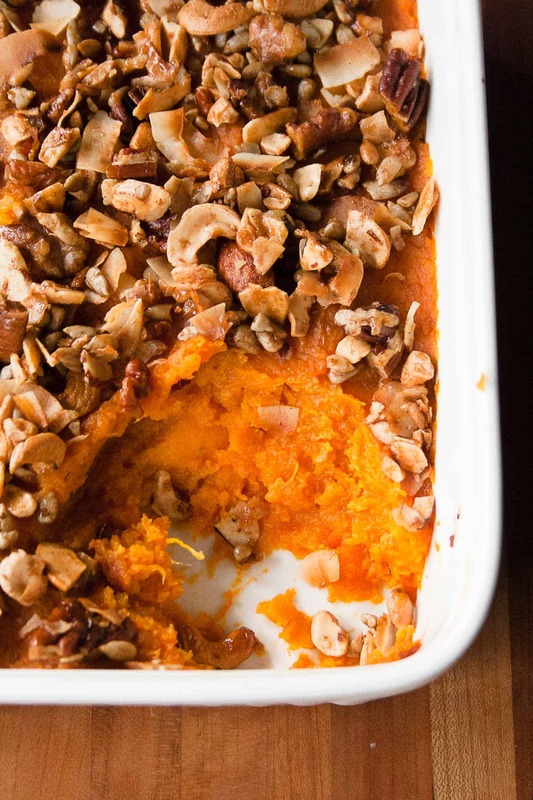 Did you grow up eating sweet potato casserole? I did not. And it’s not like my family served it and I just ate regular mashed potatoes instead (but really… mashed potatoes = LIFE); sweet potato casserole has never been served at my family’s Thanksgiving! But I am changing that this year. 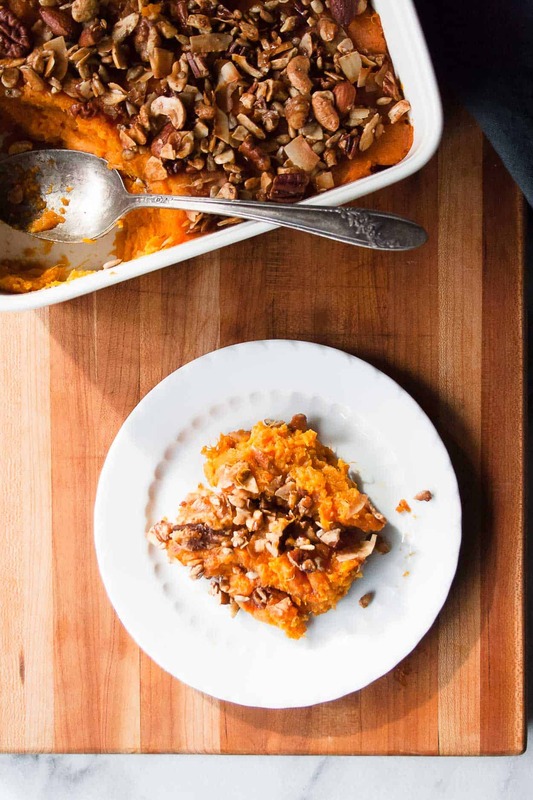 And I decided that if I was going to serve sweet potato casserole at Thanksgiving, I was going to do it my way! So there are no marshmallows on top. Instead, I reached for my favorite ingredient – my grain free granola! This granola adds the perfect sweetness, a little burst of cinnamon, and some serious crunch! Make sure you grab the e-book and get all 14 recipes today! 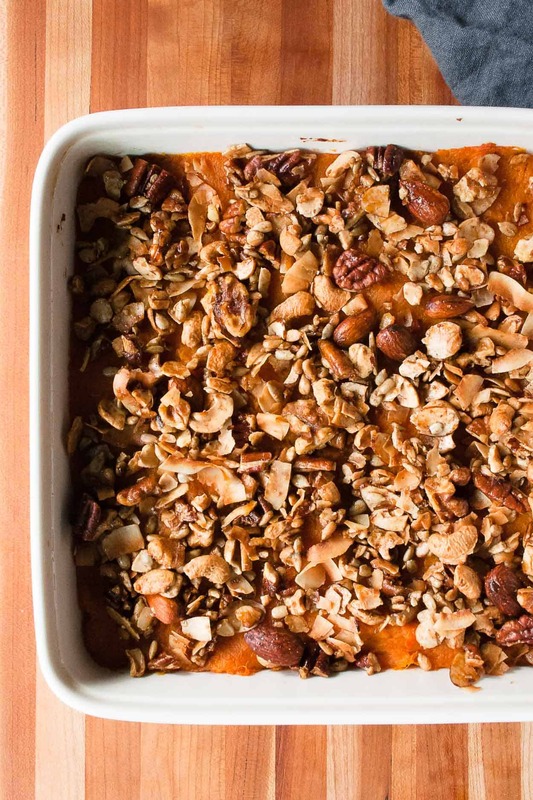 I know you are going to die over this sweet potato casserole with crunchy granola!! Make this for your fam this Thanksgiving and post a picture on social media – use the hashtag #imhungrybynature so that I can see! Stir together all ingredients except granola. Spray 9″x9″ pan with coconut oil spray. Spoon sweet potato mixture into pan and sprinkle granola evenly over the surface. You can make this recipe ahead of time if you want! Assemble the dish (except granola) and store in the fridge until you are ready to bake. Then top with granola and pop it in the oven! Make sure you pin this for your Thanksgiving menu!